From the my 401K is now a 201K department... Screwed Up Click @ Spiro's tonight, Oct 10th! I wished I had money to go see shows! Property value crashed! Stocks crashed! 401K crashed! Windows crashed! Then the fools at AIG are taking my money and partying it up at some resort. The Screwed Up Click, also known as S.U.C. is an assortment of rappers from Southside Houston started by the late DJ Screw. After appearing on numerous screw tapes and spreading their name throughout southern hip hop, they have become well respected and have earned a proud reputation. Despite the deaths of several members and the incarceration of others, the S.U.C. continues to represent for Houston and remains a strong presence in the southern hip hop scene. The original members of the S.U.C. include DJ Screw himself, Kay-K, Lil' Keke, Fat Pat, Big Hawk, Big Pokey, Botany Boyz, Big Jut, Big Moe, Z-Ro, Lil' O, Trae, Dat Boy Grace, Southside Playaz, Lil' Flip and E.S.G.. Since then, members have left while others like Woss Ness (Big Steve, Big Bee & Mistah Luv), Big Mello, TowDown, Point Blank, Yungstar, Wood, and Al-D (DJ Screw's brother) and others have joined. 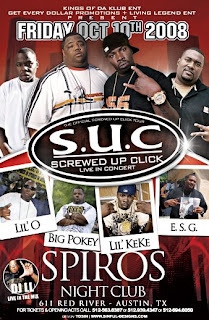 In addition, Lil' Troy, UGK and South Park Mexican are considered "Screwed Up Affiliated". 3rd Ward/South Park is the group's place of origin. In 1999 they released the "Block Bleeders" compilation. In addition to this recording, the numerous members have all played a significant role in the hundreds of DJ Screw mixtapes to filter out of Houston during the 1990s. There is also a number of Screwed Up Click members most people never heard of cause it was not limited to rappers. Many others were S.U.C. that ran the streets. Included, Baytown, .380 & Big Country.